I am a jewelry artist that specializes in making jewelry using Precious Metal Clay, which can also be called Art Clay Silver, or silver clay. I make a lot of my own jewelry using PMC, but also teach classes to students who are just beginning to get into the art of Precious Metal Clay, and I am always looking for versatile, easy to use kiln to recommend to my students. PMC kilns are not very large, and so they make a worthwhile purchase for artists and hobbyists. One of the great things about a Precious Metal Clay kiln is that you can often use the same kiln for annealing glass, fusing glass, slumping glass, and enameling. Each of these art techniques has a different kiln usage, but the temperature ranges and kiln size are similar, so they can all be done in the same kiln. I own a gallery, and teach PMC to students there, so I have been thinking about buying a second kiln that would be for students to use themselves, and I could also recommend it to them for purchase. As you can imagine, this is a lot of qualifications for a good kiln for my purposes. So when I heard about the new Skutt Firebox 8 Kiln, I thought that I would see if it fit my qualifications. This review is what I found out. The Skutt Firebox 8 Kiln is a kiln made for artist use. Therefore, you will have to go to an artist or glass supply house to buy one. The two best place online to buy a Skutt Firebox 8 Kiln is Delphi Glass. This company is excellent in terms of quality, price, and customer service, so it just comes down to which one you like better, and which one has the best deal at the time of order. The Skutt Firebox 8 Kiln has some great features that I have not seen before on a kiln like this, as well as some standard features. One of the great things about it, is that it is small enough to ship UPS, and it is a tabletop or counter top kiln which is one of the things that I was looking for. I have listed the specifications below, but one of the qualifications I have is to be able to plug into a standard outlet. This is so that students can use the kiln at home without any unnecessary electrical work. As you can see below, the Skutt Firebox 8 Kiln does plug into a standard outlet, although you can order it with a 220/240 version. The overall size is also good, as it only has a 13″ x 20″ footprint, and is less than one foot high. Perfect for most jewelry making uses. The most unique feature of this kiln is that the lid is hinged and you do not have to take it off and set it anywhere. This has been a problem in the past for me when a student would carelessly take off the hot kiln lid and either not know where to place it, or place somewhere that was not meant to take the heat of the kiln lid. The lid can also get easily bumped and damaged in classes, so the hinged lid is a real plus for this kiln model. I wanted a kiln that could be used for firing Precious Metal Clay, glass fusing, enameling, and slumping, and the Skutt Firebox 8 Kiln can do all of those things. It comes with an easy to read digital pyrometer that allows you to set and maintain holding temperatures accurately. This is important for any of the firing projects that I would recommend the kiln for. The other features that I am looking for are offered in the Skutt Firebox 8 Kiln including easy to use for beginning students and hobbyists, very few components, easy to transport, and reasonably priced. 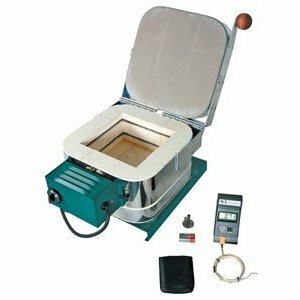 The kiln is small and lightweight, easy to transport. The kiln also heats up fast; it will reach temperature in about 20 minutes. The kiln is buckled to its base so it can’t slip off. Users can load the kiln through the top, or unbuckle the body from the floor, assemble the work, and place the kiln back over the shelf and onto the slab. This feature keeps the kiln from moving when bumped, yet makes it easy to load and unload. The Skutt Firebox 8 Kiln has a wooden handle positioned on the back that stays cool, making it safer to use during classes or at home. If you use the wooden handle, the hinged lid can be opened over 90° with one ungloved hand. When I bought my PMC kiln about 10 years ago, I paid about $400.00 for it. I still use it today, and it has held up well. The Skutt Firebox 8 Kiln is a safer, lighter, and more versatile kiln than the one I own, and comes with a two year warranty. It is priced at $468.00 retail, but if you watch carefully, you can find it on sale on Delphi Glass. This kiln definitely meets all of my qualifications with the added benefit of the hinged top. I really like that feature, and that would steer me towards this kiln over other kilns that do not have a hinged top. The Skutt Firebox 8 Kiln is definitely the one I will be recommending to my students. And Skutt is a very helpful manufacturer for any troubleshooting or help. If you are looking for a holiday gift, this makes a good one.